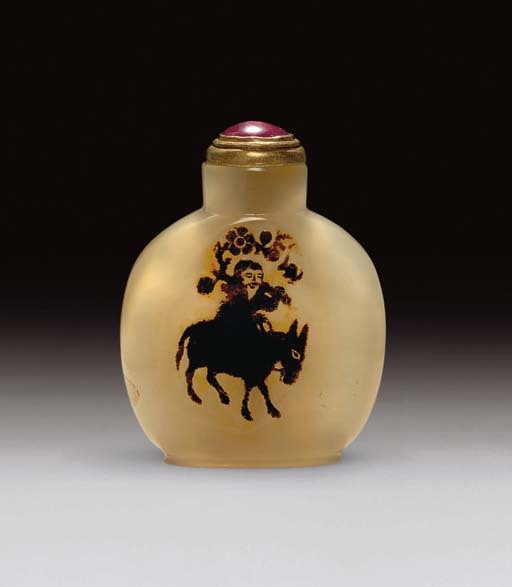 This bottle represents the silhouette style of agate carving but in a very miniature form. The style usually requires cutting through much of a thin plane of darker material to leave a shallow, silhouette design. The subject of a sage on a donkey, sometimes followed by an attendant holding a branch of prunus has been variously intepreted but Ka Bo Tsang has identified this particular figure as the Tang-dynasty scholar, poet and recluse Meng Haoren, who was reputed to have admired prunus blossoms. For a discussion of the identity of the rider depicted, see Ka Bo Tsang, "Who is the Rider on the Donkey? ", JICSBS, Summer, 1994, pp. 4-16, fig. 14. Compare the black and white jade Suzhou bottle carved with a similar design of the reclusive poet, Meng Haoran, astride a donkey followed by his attendant on foot, sold in our London rooms, 12 October 1987, lot 348 and cover, and now in the collection of Mary and George Bloch, illustrated in Moss, Graham, Tsang, A Treasury of Chinese Snuff Bottles, Vol. 1, Jade, no. 130, where a discussion of the story behind this scene is provided, p. 331. See, also, the black-and-white jade Suzhou bottle carved with the same subject sold at Sotheby's, Hong Kong, 16 November 1989, lot 13, and an example in white jade illustrated by H. White, Snuff Bottles from China: The Victoria and Albert Museum Collection, London, 1992, p. 17, pl. 1.